The CDC has issued a second warning about Kellogg’s Honey Smacks cereals as a possible source of salmonella. 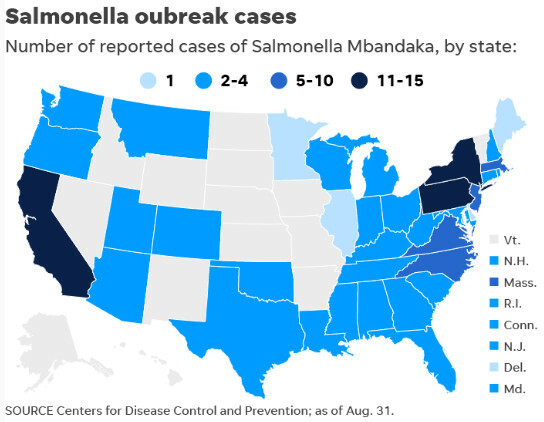 Salmonella is not a wussy ailment. According to the CDC site it can result in ““fatal infections, fever, diarrhea, nausea, vomiting, and abdominal pain, especially for young, frail or elderly people”. A healthy person will recover in 4-7 days but they will be 4-5 days of hell. Some of the miseries will be nausea, vomiting, cramping, diarrhea, fever and pain. It can even be fatal for more fragile people. Reportedly, 130 people from 39 states have gotten sick on the cereal. The CDC has requested or ordered (I’m not sure they have the authority to make such orders?) stores not to sell the cereal so if you have any in your home, get rid of it now. It’s not worth the risk.